The damage (left) and Gregor Durno. A farm worker who caused more than £120,000 worth of damage to a sheltered housing complex after smashing into it on a JCB tractor was yesterday fined just £450. Gregor Durno, who crashed a JCB tractor into homes on Land Street in Buckie at about 4am before driving off, was told he was fortunate he had not killed anyone. But he dodged jail after a sheriff imposed an alternative sentence, instead requiring him to carry out 225 hours of unpaid work. Elgin Sheriff Court was told Durno had not been alone in the tractor, with witnesses describing how he was “showing off” as he drove two friends and a three-legged collie dog along the A98 Buckie-Banff road. He drove the tractor – which belonged to his family’s farm business – at “excessive speed” through Buckie before eventually losing control on Land Street and smashing into the building. Locals reported hearing a “loud bang”, while residents inside who were awoken by the impact reported seeing a “large wheel” inside their home. 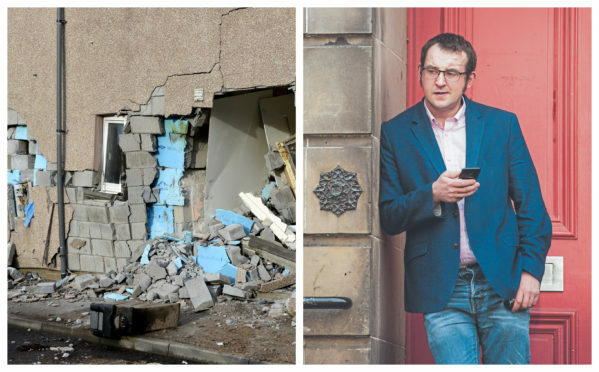 The 31-year-old made-off after the accident, but left a trail of rubble behind him which led police right to his front door. Sheriff Gary Aitken told Durno that “it was only good fortune” no-one was killed in the incident. His two passengers fled from the scene, while Durno simply drove back home – leaving a one-mile trail of debris that the police followed. When officers arrived at his farm property they discovered two Jack Russell terriers kept in “disgusting” conditions in a kitchen covered in dog mess, as well as a rusted shotgun. Defence solicitor Ronnie Simpson expressed his client’s “sincere apologies” to the residents of Land Street and said Durno had been at “rock bottom” at the time of the offence. Durno, of Cuttlebrae Farm in Clochan, pled guilty to charges of taking a vehicle without lawful authority, driving dangerously, possessing a shotgun without a valid licence and failing to take steps to ensure the care of the two Jack Russell terriers. He was disqualified from driving for 15 months, fined £450 and given 225 hours of unpaid work. Durno will also be under the supervision of social workers for the next 18 months. Insurance companies have covered the cost of repairing the building, which is owned by Ark Housing Association, and replacing the JCB tractor.